Remember the chubby-faced British Shorthair with its chipmunk cheeks and happy smile is famous as the Cheshire Cat in Lewis Carroll's Alice in Wonderland? This teddy bear like cats have a smile and a plush coat combined with a wonderful disposition that makes them most adorable family pets. Their ancestry traces back to the cats of ancient Rome, that makes it one of the oldest breeds of British cats. Once a hunter and protector of the barns, the British Shorthair of our days embraces family life, preferring to snooze in comfort and to exchange hunting for chasing a toy mice. It is a dignified, affectionate cat, sometimes referred to as the Winston Churchill of the BRITS cat world. They remain as a loyal companions for life. According to TICA historians, The British Shorthair origins begin with cats imported from Egypt that accompanied the Romans when they invaded Great Britain. One of the first breeds of the cat fancy, they have changed little over the centuries. As the breed developed, crosses were made with the Persian between 1914 and 1918 introducing the longhair gene. Cats with short coats were part of the British Shorthair and cats with long hair went into the Persian breeding programs. Early on, the blue shorthair consisted of two distinct types: the sturdy, compact British with its round head and the long, elegant Russian with its triangular head. The two types competed together and were interbred before finally separating into unique breeds. British SHORT Hair Cat described as independent, calm and intelligent. They rarely bother people around them and well adjust themselves to the area they are provided with. They would not ask you to pet them always or to pick them to your shoulder. They are not lap cats, but rather prefer to sit on a couch beside you. Not being much vocal, they tries to manage any possible thing on their own. British Shorthair cats like to follow people and would keep walking behind you like your dog. They have muscular strong bodies but they never show their energy in aggression or on destroying thing around them. They usually keep calm and would show you by gestures if they need something. Require little attention, Brits can be an ideal pet for you and your family if you don't have much time for your pet. On the other side they are very good with children. They never show aggression towards them and can be a nice playmate for younger kids. British Shorthairs are intelligent and easy to train. They get along well with other pets. All that you to need to do is an early and proper socialization. They are not very much people oriented but that does not mean you can leave them alone for a long time. They would get bored. They have the tendency to be more close to one of their owners. These small teddy bears are apartment cats and does not need much exercise. 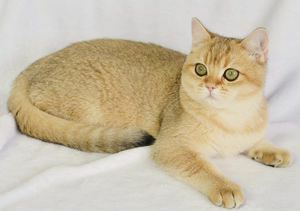 From every prospective British Shorthair cats can surely be an ideal pet for you. The British Shorthair has a short, extremely dense plush coat with a crisp feel to it making you want to bury your hands in its luxurious pile. The British Longhair adds length to the dense coat so it stands out from the body emphasizing the cat's imposing lines. In most colors, large, round eyes ranging from deep gold through copper are set widely into the smiling face. In pointed cats, the eyes are blue while deep emerald eyes shine in the silvers and golden chinchillas. The precious Golden and Silver colors are relatively new and very demanding trend among the breeders. The British are medium to large, compact, powerfully built cats with a broad, full chest, short strong legs, and a short, thick tail tapering slightly to a rounded tip. The British Shorthair has a massiveness that the plush coat emphasizes while the British Longhair cuts an imposing figure as the full coat swirls around the rounded, muscular body. Their round heads have short noses, chubby cheeks and prominent, rounded whisker pads creating an enigmatic smiling look to the face. The round eyes are wide open and, combined with the smile, give the cat an amused air as it watches over its dominion-the look that Lewis Carroll captured so well in the Cheshire Cat! These cats love food and can quickly gain weight so it is important to keep an eye on their portions to make sure they do not get fat. They are a heavy, solid cat ranging from 9 to 18 pounds but that weight should come from their massive muscular bodies, not from an excess of food. Encourage them to play, it will burns calories off while toning muscles: Teaser toys provide lots of gymnastic entertainment; training your cat to fetch adds running to their day, and chasing a laser light pen gives their muscles a real work out.